Ovo predstavljanje organizira udruga Syncro - Synergy Croatia. Održat će ga volonteri udruge na engleskom jeziku. Syncro - Synergy Croatia is an NGO active in the youth field dealing mainly with ERASMUS+ program with the purpose to create a world that works for everyone. 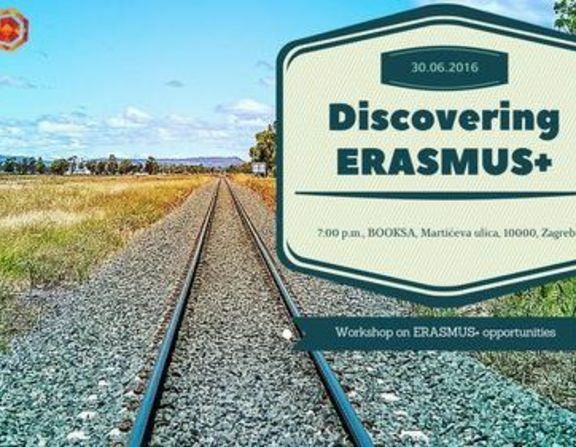 The aim of this event is to inform youth from Zagreb and surrounding cities/towns about the many possibilities that the ERASMUS+ program offers and also to deliver some tips and tricks based on personal experiences of the volunteers. During this presentation an EVS volunteer will present the main points of the ERASMUS+ program, such as youth exchanges and EVS service. The topic of official recognition of non-formal education used in ERASMUS+ in labor market (Youthpass) will also be discussed. The volunteers who will present the ERASMUS+ program are Ileana Rogoz (Romania), Antonio Greco (Italy), Fabrizio Gallo (Italy), Laima Hauka (Latvia), Naubartas Urmanas (Lithuania) and Stefano Silvestrini (Italy).